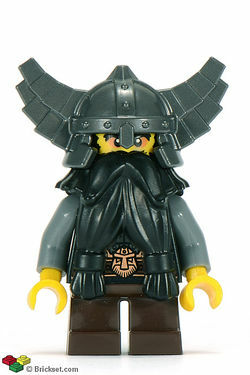 The Evil Dwarf is a Collectable Minifigure released in 2011 as one of the sixteen minifigures from 8805 Minifigures Series 5. He is similiar to the dwarves released in 2008 with the Castle sets. The Evil Dwarf has dark brown short legs and a black torso with dark grey arms and yellow hands. His torso has armor markings and a belt with a dwarf head symbol on it. He has a black beard and a yellow head with a frowning face, black eyes with white pupils and light nougat rings around it. His face also feature a beard, mustache, and side burns. The Evil Dwarf has a metallic dark drew winged dwarf helmet, a double-headed battle-axe made up of a 3-stud-long reddish brown pole and two titanium metallic axe-heads. He also comes with a small round shield with dragon markings. The Evil Dwarf is the first Collectable Minifigure (from 8805 Minifigures Series 5) who has short legs along with the Small Clown. He was featured in the online game, "Tree Challenge" along with the Lumberjack. The emblem on his belt resembles the prototype crest for the Dwarves from Castle (2007). This is a description taken from LEGO.com. Please do not modify it. (visit this item's product page) Whatever you do, don’t make fun of the Evil Dwarf’s beard! You can tell him his armor is squeaky, his axe is rusty or his iron helmet is totally unfashionable for modern dwarf society, and he’ll just grin and laugh. But say one word about his prized whiskers and you’d better hope you can run away fast! Ever since he was a lad in the deep-down Dwarven Kingdom, the Evil Dwarf has been proud of his bristling black beard. It turned him into quite the bully! Imagine his surprise when he discovered that not everybody on the surface respected fine follicle growth. Now the Evil Dwarf sells his formidable battle skills to whoever offers him the most gold – as long as they never, ever belittle the beard! Whatever you do, don’t make fun of the Evil Dwarf’s beard! You can tell him his armor is squeaky, his axe is rusty or his iron helmet is totally unfashionable for modern dwarf society, and he’ll just grin and laugh. But say one word about his prized whiskers and you’d better hope you can run away fast! Ever since he was a lad in the deep-down Dwarven Kingdom, the Evil Dwarf has been proud of his bristling black beard. It turned him into quite the bully! Imagine his surprise when he discovered that not everybody on the surface respected fine follicle growth. Now the Evil Dwarf sells his formidable battle skills to whoever offers him the most gold – as long as they never, ever belittle the beard!